I have seen Edwardo at shows from time to time, and I am sure you have too. 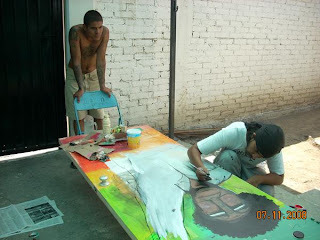 I didn’t know much personally about the man untill I read a bulletin that he posted on myspace advertising his most recent project, Art Monger Mondays. After I did some snooping around, I found out that Edwardo is a man of action and empowerment. I found out he has done cool community art projects and classes, teaching the little guys of the valley about what the bigger guys are up to. Pretty awesome, right? I then read further that Edwardo is putting together a little program for the bigger guys. 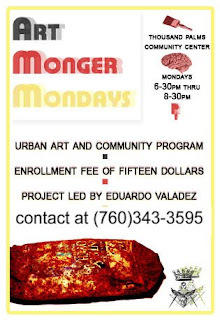 What I mean by this is, Art Monger Mondays is a community program for the local art scene to meet up, congregate and collaborate together on bigger projects. I thought I would share this great idea with everyone and encourage every artist out there reading this to give this a shot. When everyone comes together the possibilities really are endless. 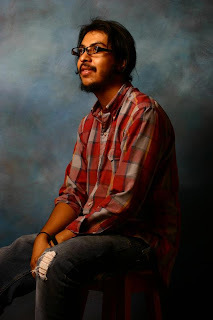 Without further ado, I introduce the community arts man, Edwardo Valadez…. I’m originally from Mexico City, but grew up in the desert from a crowded apartment in Palm Desert to a humble abode in Thousand Palms. What type of artist am I? Idon’t know an active one a type of artist who wants to see more support in the arts. And a unity among young artist and creative people alike. I am an artist with alot of ideas I wish to share with the world. But my community is my world now and here we are so our immediate surroundings should reap the product of our involvements and if we stay stagnant it will reap the lack of our involvement I think the choice is clear. How do you think where you grew up influenced you as an artist? Growing up in the desert influenced me greatly. The diversity in lifestyles is influential as well, but mostly the teachings of my Mother be open and understanding to all people this ideology has taken me into places I never thought I would go and do handshakes with people I never thought I would know. The desert is a wonderful birthplace for creativity. Sometimes so slow pace that we have no alternative but to draw ourselves to spray cans, paintbrushes and record collections. Other times so rambunctious it plants cluttered thoughts in our minds we can use later to inspire a dull moment in time. Give me a run-down of what your program is and what you will be doing. 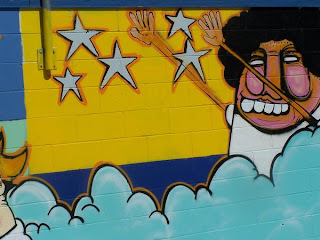 The “Urban Art Program,” as the Park District deamed it, will be a program as I envision it where a collective group of artist can come together once a week to share creative ideas and work on projects and series together. Whether it be stickers posters,photographs,signs and even murals if approved by the city. Also it would be a place where we can congregate to talk about current events and how to address them as our responsibility should be if we call ourselves artists. All to the soundtrack of guest DJ’s and musicians. The program is in its infant stage but with input by the members who choose to join we can encourage its growth. Are there any age limitations to your program? If it were up to me there would be none. But unfortunately there is a maximum of 20 members per month. But really I think limitations fall on us . If there is a limitation ingenuity should always reign victorious. And if there is will, theres’ a way . 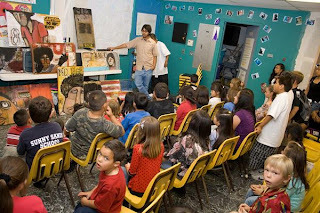 The reason I started this program is because of I see a lack of involvement by the youth in our desert for the arts. Although it is picking up, I think it comes and fades. And I believe if we have a set place to meet, even if is is only once a week or for a couple hours, there could be a better cohesiveness in the idea of being active. Plus, I think it is my responsibility to do so if I am truly to call myself “active” in the artist world. I had many of people help me in my life so I think this is a way of giving back somehow. What do you want people to walk away with after they finish your program? If anything, I would walk them away with a sense of inspiration and with some new comrades. And pride, because I think if we pursue this we can have many good things come from it. And that would no doubt be something to feel proud about. Do you have plans to do more of these? Of course. But time will tell. Where can we check out your art? Myspace moslty. Mi casa tambien, over some drink and in the company of barking pitbulls. Can I have all the details one would need to sign up for this program? Professor Valadez to you, that is…. 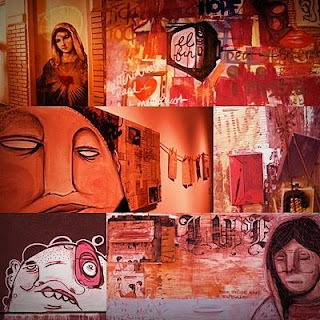 To check out more works by Edwardo please click HERE.